Pam Gray is the glue that holds everything together at Tieger Realty. She wore many “hats” before joining us 6 years ago: legal secretary, professional photographer assistant, and family day care provider to name a few. As a wife, mother of 4, grandmother of 6, and proud owner of a home just over the border in Royalston, Massachusetts, she has an understanding of the complexities and uncertainties of life and is rewarded by assisting people with their home ownership dreams. 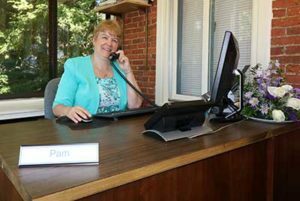 Pam’s is the welcoming voice you’ll hear when you call.Everyone she speaks with receives her warm, personal attention. Give her a call today or stop in and visit her on the front porch! You’ll be glad you did. Hi! Thank you for visiting our website. We hope you found the information that you were seeking. If you would like to see one of our homes, are thinking about selling your property, are considering a move to our area, or simply want to “talk real estate”, we would welcome the opportunity to work with you.